Anytime you go to work, you face the danger of a slip and fall accident. 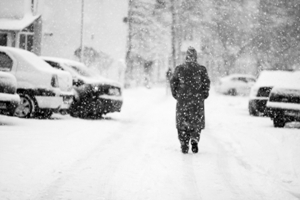 Your risk increases significantly in the winter when you also must navigate slippery snow and ice on your way into your workplace and when you leave to go home. What happens if you injure yourself in a slip and fall accident? Are you entitled to workers’ compensation benefits? Can You Receive Workers’ Comp If You Fall in Your Workplace Parking Lot? The issue that could determine whether or not you are entitled to workers’ compensation benefits is the employer’s level of control of the parking lot. If your employer controls the parking lot, you may be entitled to benefits, even though you technically were off the clock and had stepped off your employer’s property. Ways that you can show that your employer controlled the parking lot include showing he owned the property, paid property taxes on it, paid for landscaping and lawn maintenance, or paid for snow and ice removal. In addition, if your employer rented the building where you work, his lease could have provided that the parking lot was a common area that he was partially responsible for maintaining with other tenants, or that he was completely responsible for maintaining it. In these situations, your employer may be considered in sufficient control of the parking lot to entitle you to benefits. Whether or not you have a workers’ compensation claim, you may have a claim for compensation against a third-party, such as the owner of the property, if you can show that this party’s negligence caused or contributed to your injuries. You may be entitled to workers’ compensation benefits if you slipped and fell in a parking lot while doing an errand for your employer, traveling between your employer’s workplaces, on a customer’s work site, or more, under exceptions to the going-and-coming rule. You will need an experienced workers’ compensation attorney to help you determine your rights to workers’ compensation benefits in a complicated situation like a slip and fall on ice or snow. You will also need help understanding your legal options to pursue a claim against additional parties. Pursuing all of your claims is important to increasing the likelihood that you will be fully compensated for your injuries. Start an online chat or call us to schedule your free consultation.